The Undertaker, Kane, Triple H, and Shawn Michaels all appeared on last night's go-home show for Super Show-Down. 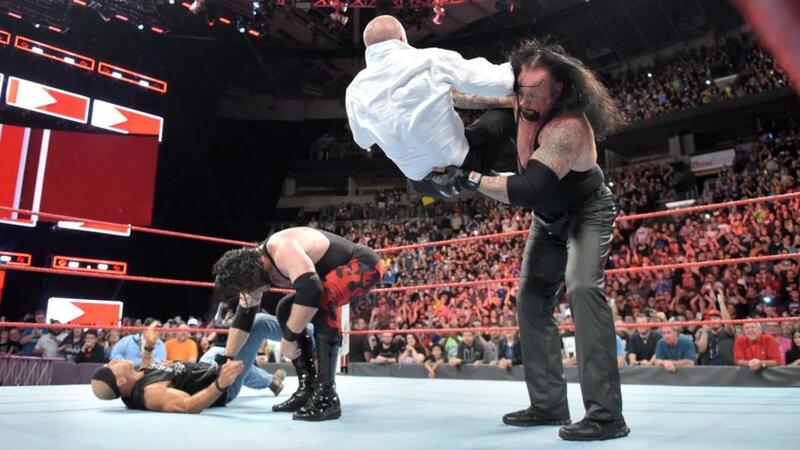 Kane interrupted a promo from Michaels during the main event segment of Raw, The Undertaker appeared in the ring, and Triple H came down to make the save. But it was Undertaker and Kane who stood tall heading into Super Show-Down after giving Triple H and Michaels double chokeslams and tombstones. Undertaker will face Triple H in Melbourne, Australia on Saturday. Kane will be in Undertaker's corner, and Michaels will be accompanying Triple H.
Also on Raw, the storyline teasing Dean Ambrose leaving The Shield continued, Ronda Rousey took on Ruby Riott, and Elias and Kevin Owens got huge heat from the Seattle crowd for joking about the SuperSonics leaving the city. Alexa Bliss talks about the "first time she met Trish Stratus"